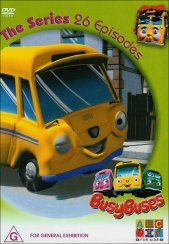 ABC Home video presents this delightful disc that the Kids will love about a group of buses that are located at a busy Terminal. Each bus has its own distinct personality and they all have adventures in which they help each other and discover new things. The buses are cute and personalised with faces, hair and the like. The adventures they have are amusing and sure to keep the kids entertained. 01. Sammy Meets a Monster. 02. Stephanie and the Queen. 04. Colin Needs a Bath. 05. Sammy Nearly Takes Off. 08. Sammy�s First Day at School. 11. Arnold in a Tight Spot. 13. Sammy in the Snow. 17. Sammy Has a Paddle. 18. Roger Meets His Chums. 19. Arnold Gets a New Coat. 20. Frank Comes to Visit. 22. Sammy Wins the Day. 25. Sammy and the Wrong Day. 26. Sammy and the Acrobatic Bus. Like Thomas, the series is narrated and there is not any real surround activity, most of the sound comes from the front channels, and the video is a full screen 4:3 ratio. The disc is single layer, and you can see some telltale compression, but nothing the kids will notice.